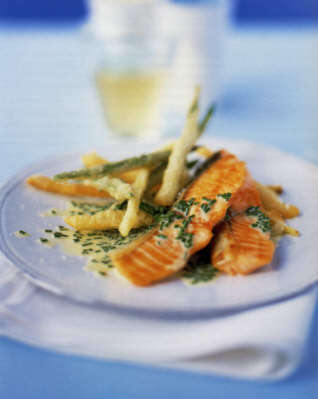 The following salmon recipes and photographs have been reproduced from "Nick Nairn's Top 100 Salmon Recipes" with the permission of the author, Nick Nairn. Nick is one of Scotland's top chefs. He runs his own highly acclaimed restaurant and cookery school and is well known for his regular appearances on BBC television. The recipes listed below are just a few of the one hundred original and inventive recipes so clearly described in Nick Nairn's book " Top100 Salmon Recipes". I'm very partial to salmon teriyaki, but always found it a bit tricky to cook. This was because I'd previously cooked it in the frying pan, where it tended to stick as the honey in the marinade burned before the salmon was cooked. A flash of inspiration led me to try leaving the honey out of the marinade, reserving it to brush over the salmon once it was cooked, and - bingo! - trouble-free teriyaki ever since. 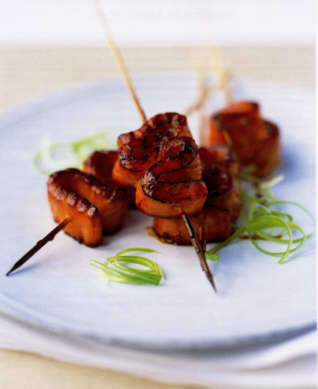 Remember: soaking the wooden skewers in water before grilling will prevent them from burning and disintegrating. 2 Cut the salmon into long, thin strips, 2.5 cm (1 inch) wide and about 5mm (1/4 inch) thick. 3 Mix all the ingredients together, except for the honey, and toss the salmon strips in it. Cover and leave for 10 minutes to marinate. Heat a griddle pan (or grill). I've "borrowed" this dish from my good friend and top chef Phil Vickery. He prepared something similar on a TV programme called Who'll Do the Pudding? Tucking into the remains of Phil's food, I remarked that it was an excellent and clever dish. The ever-cynical Vickery replied that he was certain to find it in one of my books in the future, and sure enough here it is - my way, of course! 1 To make the batter, whisk the flour, lager and salt and pepper together until smooth. 2 Heat the oil to 190 degrees C/ 375 F in an electric deep-fat fryer or large pan (use cooking thermometer if necessary). Dip the beans into the batter a few at a time. Plunge into the hot oil and fry for a few minutes until crisp. Lift out and drain on kitchen paper. Keep warm in the oven with the door open while you fry the rest..
3 Stir the chives into the Butter Sauce and keep warm for a few minutes while you cook the salmon (but do not let it boil or it will split). 4 Heat a non-stick frying pan until very hot and fry the salmon escalopes on one side for one minute until beginning to brown but still moist. Lift out of the pan on to a plate and keep warm..
5 To serve, place a pile of beans on each plate and set a couple of slices of salmon on top, spoon over the chive butter sauce and serve immediately. This dish is so simple yet so tasty. If you've got time, you could use home-made pasta here; if not, dried thin tagliatelle or linguine will do a fabulous job. What make this dish so good are the salmon juices, which mingle with the butter and lemon in the oven, so when you're pouring them over the pasta, use a spatula to scrape out every last drop. 2 Melt the butter in a small roasting tin and add the lemon rind and juice. Season with plenty of salt and pepper. 3 Lay the salmon fillets in the roasting tin and turn them around in the lemony butter, ending up skinned-side down. Place in the oven for 7-8 minutes until cooked through but still moist inside. To test whether the salmon is done, give the fattest part a gentle squeeze and it should give slightly - if it's still wobbly, pop it back into the oven for another couple of minutes. If it feels solid, it's overcooked. 4 Meanwhile, throw the pasta into a large pan of boiling salted water and cook according to the packet instructions until al dente. Take the salmon out of the roasting tin and place on a warmed plate. Drain the pasta, mix with the lemony buttery juices collected in the salmon roasting tin and add the parsley. Divide the parsley between four warmed plates. Set the baked salmon fillet on top and tuck in! In the Latin American world this dish is known as escabeche, meaning "pickled fish". The fish is normally coated in flour and fried before being marinated in olive oil, vinegar and herbs and spices. I have simplified this by pan-frying the salmon without coating in flour - it tastes and looks much cleaner! Serve it at room temperature, not straight out of the fridge. Instead of using fresh coriander, you could try fresh marjoram or oregano, or even freeze-dried oregano. 1 Wipe a non-stick frying pan with a little olive oil and fry the salmon fillets for 3-4 minutes on each side until just cooked through. Remove from the pan and lay in a single layer in a non-metallic dish. 2 Wipe out the pan again until clean and dry-fry the coriander seeds until they begin to release their aroma. Tip out of the pan and lightly crush. 3 Mix the crushed coriander seeds with all the other ingredients and pour over the salmon. Cover with cling film and leave to marinate in the fridge for at least 12 hours. Serve the salmon fillets at room temperature with a couple of tablespoons of marinade, a bitter leafy salad and plenty of good crusty bread to mop up. I normally make this soup using a blend of fish stock and mussel juices; however, I know that most home cooks don't have ready access to that kind of kit, and so for this book I experimented using a fish stock cube - not great. I then tried my personal favourite, a Knorr chicken stock cube, and found that it made a really good soup, although perhaps not acceptable to "pescatarians" ( I know, it was a new one on me, too - it means fish - eating vegetarians! ); alternatively you could use a vegetable stock cube. The base can be made in advance and freezes well. Add the salmon just prior to serving. Be careful not to overcook the salmon; it needs only a couple of minutes. You can check by breaking one of the pieces open - it should still be nice and pink inside. 1 Heat the oil in a large pan and add the ginger, garlic, chilli and lemongrass. Cook over a low heat until softened. 2 Add the stock and splash in the Thai fish sauce, soy sauce and lime juice. Bring to the boil, then turn down the heat and simmer for 10 minutes. Add the spring onions and cook for a further 3 minutes. 3 Add the fish with the coriander and simmer for 2 minutes or until the fish is cooked. Taste, season with salt and pepper and add more fish sauce or soy sauce if you like - it should be quite punchy! Ladle into warm bowls and serve. I have shown just five of the one hundred inventive salmon recipes in Nick's book. Other original recipes include "Peppered Salmon with Whisky Cream Sauce", "Seared Salmon with Hot Potato and Tomato Salad", "Salmon and Prawn Pie with Cheddar and Mustard mash", "Smoked salmon, Cream Cheese and Black Pepper roulades", "Char-grilled Salmon Steaks, Asparagus and Poached Egg", "Salmon, Lemon and Saffron Soup", "Smoked Salmon Eggs Benedict", "Salmon Sashimi", "Roasted Salmon with Fennel, Celery and Black Olives", "Salmon Laska", "Cajun Spiced Salmon with Cucumber Salad", "Salmon and Mango Salsa", "Seared Salmon Nicoise", "Salmon Baked in Filo with Spinach and Feta", "Salmon Satay", "Salmon Pilaff with Saffron, Raisins and Pine Nuts", "Oatmeal-crusted Salmon with Mustard Sauce", "Hot and Sour Salmon" and "Seared Medallions of Salmon with Hot Pepper Marmalade". One of the greatest attractions of salmon is how well it adapts to different cooking methods. Whether steamed, poached, grilled, baked, fried, smoked or eaten raw as sachimi, each method produces different results in terms of texture and taste. Whichever method you choose, it is vital not to overcook it. Really, it comes down to personal preference, but I believe that salmon should be served the same way as steak: medium rare. In practice, this means that the salmon should still be pink inside when it is served. To test, give it a gentle press or squeeze. 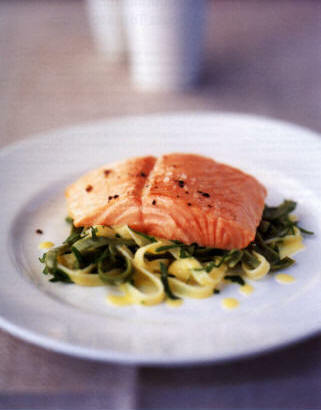 Perfectly cooked salmon will give slightly, but not too much; if it's wobbly or jelly-like, then it's undercooked. Salmon which is firm to the touch is definitely overcooked and you'll find eating it akin to chewing on cotton wool. Baking Preheat the oven to 200°C/400°F/Gas Mark 6. Dot the fillets with butter or drizzle with olive oil, season and place them on a greased baking tray. Put them in the oven for 7-8 minutes. Char-grilling Using a ribbed cast-iron griddle pan is the easiest way to recreate the charred smoky flavour of the barbecue. To prevent the salmon sticking to the pan, make sure you oil the salmon, not the pan and don't be tempted to fiddle with the fillets while they're cooking. To form the characteristic "stripes", cook for two to three minutes on one side, then rotate the fish through 90° and cook for a further two minutes. Repeat on the other side. Season and serve. Grilling Preheat the grill to the highest setting. Line the grill pan with foil, dot the salmon with butter or drizzle with olive oil and grill for two to three minutes on each side. Season and serve. Pan-frying/searing Heat a non-stick frying pan until very hot, then add a little sunflower oil. For thin cuts, fry the fillets for 2-3 minutes on each side, to get a caramelized crust; for thicker cuts, reduce to a medium heat once the salmon has been added, then cook for 5-7 minutes on one side and a further 2 minutes on the other side. Season and serve. Poaching Fill a wide frying pan with water, just deep enough to cover the fillets. Once the water is barely simmering, poach the fish for about 5 minutes, until opaque and just set. 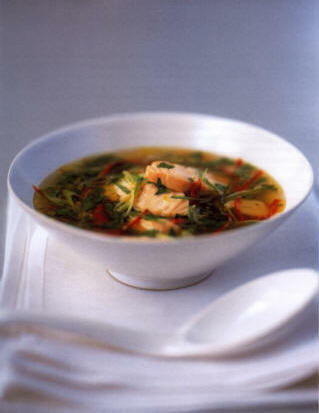 Using flavoured stock or even some lemon juice adds an extra dimension to the taste. 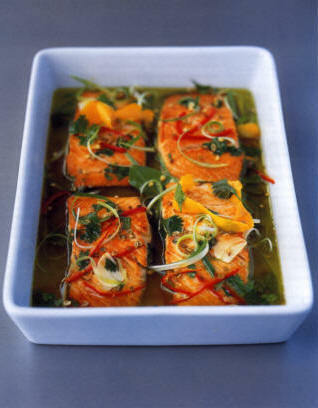 For cold-poached salmon, slip the salmon into the simmering water, remove from the heat and leave to cool. The salmon will poach slowly in the cooling water. Season and serve. Steaming This is the healthiest way to cook salmon. Throw some aromatic herbs, say tarragon or thyme into the base of a steamer, add water and bring to the boil. Place the salmon, lightly oiled, into the steamer basket, put on the lid and steam for 5-8 minutes, making sure the steamer doesn't boil dry. Season and serve.